Support Fam Club at Film Fests! Merch! Buy a shirt, support Fam Club! 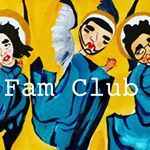 Fam Club on Instagram! So much bonus material! Connect with Fam Club on Facebook!